The Author Dashboard is a personalized reporting tool for authors with works published in Digital Commons or SelectedWorks. As an author, you can easily access your dashboard to view up-to-date download information for every work you publish, as well as global insights into the sources of readership. Use the Dashboard to quickly pull up readership for a body of work or for individual articles. Explore recent data, all-time, or choose a custom date range. You also have options to share your data with others and export statistics for use in external applications. The Author Dashboard will reflect institutional branding if an author’s institution is a SelectedWorks subscriber. To access your Author Dashboard, visit https://readership.works.bepress.com/. Enter the email address and password associated with your bepress account if prompted to log in. From your SelectedWorks profile, click the main menu and select Author Dashboard. From Digital Commons, click Author Dashboard in the Dashboard Tools section of your My Account page to view your dashboard. Use the dashboard link in your monthly readership report email. The following options appear at the top of the Author Dashboard for viewing account details and for controlling what appears in the dashboard readership widgets. Use the menu button located at the top right of the dashboard to navigate to your SelectedWorks profile page, view account settings, or log out if on a shared computer. Select a specific date range using the date picker. Readership widgets and reports adjust to reflect the dates shown. Past 30 Days: A 30-day snapshot including today’s date. Last Month: The previous calendar month, which correlates to the monthly readership email report. Past 90 Days: The maximum amount of time for which daily results are provided. All Time: Monthly data going back as far as readership data is available. 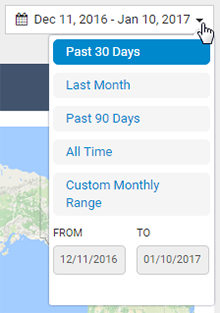 Custom Monthly Range: Allows you to select a custom range of available dates containing data for your works. The date range is inclusive, so to run a report on a single month, select the same month for the start date and end date. Use the individual works drop-down list to choose a specific article for which to view statistics. Type in the search box to narrow results. This filter will adjust information in the widgets to only show data for that work. Articles that were imported from Digital Commons to SelectedWorks will appear as two separate titles in this list. Hover over a duplicate title to see its location. Download counts from the shared full-text file will be the same, but metadata hits for the separate article information pages will differ. As you scroll down to browse the readership widgets on the dashboard, the individual works filter and time frame toggle stay at the top of the screen for easy filtering. Readership: Get a comprehensive picture of where and how users are accessing content geographically, by institution, and over time. Usage Reports: View reports showing downloads, metadata page hits, works posted, or individual works within the time frame selected. Share the Dashboard: Access saved dashboards and share links to quickly demonstrate impact to others with no login required, and track their views. The Save & Share button allows you to save a view of the dashboard with the currently selected filters. This can be a view you wish to come back to or one you’d like share with others. Whenever you’d like to save a dashboard view, click Save & Share. Enter a Title and Description (optional) and click Save. Next, you’ll have the option to share a link to the saved dashboard view. The “Copy” button changes to “Copied” when clicked and you can paste anywhere you’d like to share. A user who clicks on a share link can explore the dashboard, but they won’t be able to see your account or SelectedWorks profile tools (if applicable), or the Share the Dashboard tab. You may close the window if you don’t wish to share at this time. In either case, the view will be added to your Saved Dashboards list on the Share the Dashboard tab. 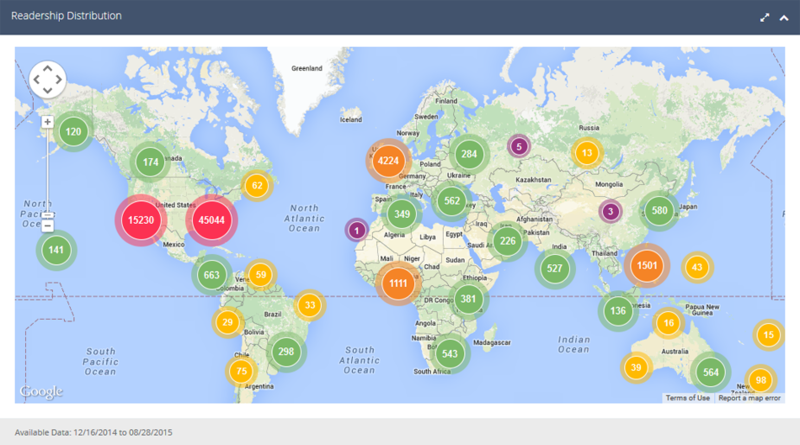 On that tab, you’ll find a Share button for your saved dashboards anytime you want to share. More details are available below in the “Share the Dashboard” section. Each of the widgets on the Readership tab provides a unique view on your work’s readership. 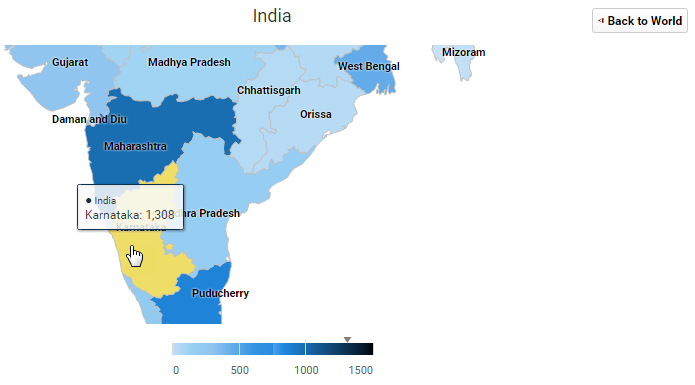 Explore downloads geographically using the Readership Distribution Map and Countries widgets, or see sources of readership with Institutions and Referrers. You can focus on certain parts of the dashboard by collapsing and expanding widgets as needed. The dashboard map displays download counts by region for the date range selected. If the dashboard is filtered for an individual work, the map will update to show download data for that title. Click the download clusters to zoom in to a more granular view and to see details of downloaded works. Use the +/- zoom tool to get a more detailed view of download locations. Use the up, down, left, and right arrows to move the map–or simply drag with the hand tool. Click the view larger icon to expand the size of the map, which can be useful on a mobile device. Cluster colors indicate the number of digits in a region’s download totals. Clicking a cluster drills down two levels. Click the cluster markers to zoom in and reveal more detailed clusters. Clicking the lowest-level marker will display readership details, including the titles of downloaded works and the institution(s) where they were accessed, if applicable. Results can be sorted using the arrows at the top of each column. The Institutions widget displays organizations, universities, and other settings where full texts were downloaded, along with the number of downloads at each. Institutions have been identified by their IP address. The time period reflects the current date selection for the dashboard. Click an institution type or color block to filter the list by type, or select from the Filter by type menu. The institution types are: Commercial, Organization, Government, Military, Education, and Library. To return to viewing all institution types, select “Show All” from the menu. Start typing in the table’s search box to find a particular institution or institution type. You can show more than 10 entries in the table by selecting a different number from the “Show ___ Entries” drop-down list. Results can be sorted using the arrows at the top of each column. Use the arrow to the left of an institution to view individual article downloads. If you see an institution in an incorrect category, tell us about it! Click the edit icon next to the institution type for an expanded institution and complete the form. The search box in the table may be used to further refine institution results. Clicking Export will allow you to output whatever is currently showing in the widget to either CSV or PDF. If no search has been performed, all entries in the widget will export. Whether exporting a full list or a filtered list, only top-level institution data will be included, exclusive of any article-level details available by manually drilling down. The Countries table shows top downloads by country, which are easily broken down by region or state using the interactive map. Countries have been identified by IP address. Click a country on the map to see a regional distribution of that country’s readership and to populate the table with the regions displayed. Hovering over a region on the map provides a quick view of the associated downloads. To return to the world map, click the “Back to World” button. You may start typing in the search box at the top of the table to find locations. You can show more than 10 entries by selecting a different number from the “Show ___ Entries” drop-down list. Results can be sorted by using the arrows at the top of each column. Clicking the arrow to the left of each entry drills down to article details for the selected country. Clicking Export will allow you to output whatever is currently showing in the widget to either CSV or PDF. If no search has been performed, all entries in the widget will export. Whether exporting a full list or a filtered list, only the country-related data will be included–exclusive of any article-level details available by manually drilling down. The sites listed here reveal the sources of inbound traffic to full-text documents. Use the search box to find specific referrers and export current results to a CSV file. You can show more than 10 entries by selecting a different number from the “Show ___ Entries” drop-down list. Sort the list by using the arrows at the top of each column. Note that some valid downloads do not have associated referral data, because not all users pass along referral information. Over the years, fewer and fewer browsers and search engines have passed along this information, so referrer numbers now include only a small fraction of traffic. This widget shows the number of downloads for all of your works, within the time frame currently selected for the dashboard. Click the Include additional files box if you wish to count supplemental files such as datasets, book chapters, or presentation materials. Additional file downloads will display in red at the top of graph bars. Hovering over a bar on the graph displays the corresponding number of downloads and the date when those downloads occurred. Note: If you have had any withdrawn articles, the individual article download counts listed in the Works table may not add up to the total download number shown here. This is because the withdrawn articles themselves are not included in the Author Dashboard, but any downloads for withdrawn articles are counted in your total number of downloads. This graph shows traffic to article metadata pages (aka, item information pages) during the active time frame. Downloads tend to be higher than metadata page hits, since users frequently access full texts directly via search engines. Metadata page hits can offer insights into how readers browse and search to find content, type a URL from a citation, or click metadata page links in search results. The Works table at the bottom of the dashboard shows a list of all published works, similar to the individual works drop-down list at the top of the page. Clicking the title of a work changes the other dashboard widgets to show readership data for that submission only. Click the external link icon to the left of each title to visit that work’s article information page in Digital Commons or SelectedWorks, depending on where it is published. If a work was imported from Digital Commons into multiple SelectedWorks author profiles, you will be given the option to choose which profile to visit when clicking the external link icon. The work itself is counted only once in the dashboard, and all versions in SelectedWorks will have identical download counts due to sharing a single file. Associated metadata page hits will vary for duplicates depending on each profile’s traffic. When you click the title of an article with duplicates, you can choose which version to explore on the dashboard. The Works table shows all published works whether or not they have been downloaded. Any works in the table with zero downloads will appear with “n/a” in the downloads column. If you wish to export download data for all of your works available in the Author Dashboard, use the Export button in the Works table. All works will be included in the export as long as a search hasn’t been performed to filter the results. You may also use the search box to filter results for individual works or subsets of works, and exporting will restrict output to those results. Visit the Share the Dashboard tab to see the dashboard views you’ve created using the Save & Share button. 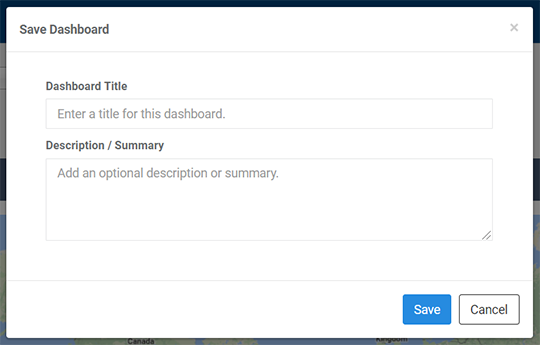 You can edit items in your Saved Dashboards list and use the Share links to demonstrate impact to stakeholders or share stories in your dashboard with others. Title and description entered when saving the dashboard. Pencil icon for editing the title and description. A Share button with the same Share Link option available when using the Save & Share button (described above on this page). The number of visits by people with whom the dashboard is shared. Views are tracked as users click the link to visit the dashboard. Trash can icon for deleting the dashboard. Links to shared dashboards do not expire. However, you may delete a link at any time if you no longer wish to provide guest access to a particular view. Sharing a dashboard generates a link to a specific initial view of the dashboard to share with stakeholders or individuals. No password is required for users who access the dashboard via share links. A user who clicks on a share link can see the initial view plus explore the rest of the dashboard. However, they won’t be able to see your account, your SelectedWorks profile tools (if applicable), or the Share the Dashboard tab. If you have any questions, please write Consulting Services at sw-support@bepress.com, or email dc-support@bepress.com if your institution also has Digital Commons. You may also phone us weekdays at 510-665-1200, option 2, 8:30 a.m. to 5:30 p.m. Pacific time.